Railroad tracks divide Rimini's famous beachfront resort, on Italy's east coast, from its ancient city center. We arrived in 15C sunshine, a perfect day for walking to our hotel at the sea, even though bus #10 would have whisked us there from the train station. The bus was a great time saver during our stay for trips between the hotel and the old town center. We turned right on exiting the train station and then right again on Viale Principe Amedeo. This avenue is lined with glorious villas and green areas which made for an invigorating walk. At the end of the street is the heart of seaside Rimini, Parco Fellini and the Grand Hotel. This is where the first bathing establishment was set up in 1843. The hotel was the first significant accommodation enterprise on the coast and become the symbol of a new type of tourism. We continued to the right along Viale Amerigo Vespucci, the boulevard that runs parallel to the beach promenade. This smart avenue is lined with a multitude of hotels, restaurants, cafes, bars, clubs and boutiques, some of which were closed for the winter season. The Hotel Trieste was a few blocks down at Viale Trieste 4. We were warmly welcomed and within minutes we were ready to begin exploring. Everything about the hotel is low key and modest from the size of the rooms to the furnishings. There is complimentary internet access in the lobby. The buffet breakfast was beautifully presented and maintained and the huge glass of freshly squeezed orange juice every morning was a real treat. The beach is long and deep and it is easy to see why it is so famous. Colorful bathing establishments dot the sand and we were told that in the summer it's not unusual for there to be 18 rows of umbrellas covering every inch of space. This Marina Centro area is a beehive of activity in season with trendy bars, clubs and restaurants catering to young merrymakers as well as families. Marina di Rimini, next to the port, can accommodate up to 680 boats. We are not really beach people and once we captured the big picture we were off to the real Rimini, the old town center. We hurried over to Piazza Cavour and Piazza Malatesta for market day. 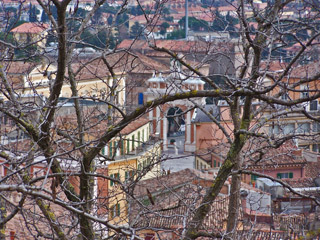 The area is huge and so is the market, easily the largest in all of Emilia Romagna. We got to see the entire population of Rimini and all the surrounding towns. The values must have been extraordinary judging by all the money changing hands and the amount of stuff everyone was carrying. Piazza Cavour, the principle square, is home to the Arengo and Podesta Palaces. The 1204 Arengo was the hall of justice and municipal assembly. The Podesta now houses the municipal residence. In the center of the square is the Pigan (pine cone) fountain whose waterspouts can be mesmerizing. Running off Cavour is the Vecchia Pescheria, a long narrow brick canopy over stone tables, which were used for displaying the daily catch. Behind the old fish market is Piazzetta Gregorio da Rimini, a tiny square with pubs and bars, a hub of social life in the city. The formidable Malatesta Fortress from the 15th century in the piazza of the same name became a Papal Fortress in the 17th century and then a prison until 1967. Today it is a venue for cultural events. Our interest in visiting Rimini was sparked by an old friend, Daniele, who had worked at La Paloma, our favorite gelateria in Toronto, before he returned home to Rimini to open a tavola calda. We had a wonderful reunion and it was a joy to see the realization of Danieles dream. He and his partner, Marco, are rightly proud of Saporito, via Michele Rosa 17, Tel. 0541 29546, directly across the street from the Mercato del Pesce (fish market). Saporito is usually open early morning until about 15:00. They're willing to go beyond the usual hot table format to accommodate special requests. There is seating on several levels as well as an outdoor patio, weather permitting. What to choose when everything looked so delicious including the spaghetti and clams several gentlemen were demolishing! We couldnt pass on the fantastic lasagna as our primi, traditional meat version for Linda and mozzarella with proscuitto for me, and with the fish market across the way, the lightly breaded, grilled, crunchy shrimp and sweet tender calamari were fresh and fabulous. The prices are extremely reasonable for this quality, quantity and preparation. Daniele, Marco and Iris, Marco's sister, the magician in the kitchen, are sweet, friendly people who deserve the success they are enjoying. Not too far away at the end of Corso D' Augusto is the grand Arco d'Augusto (Arch of Augustus) built in 27 B.C. to honor Octavian Augustus. The arch was once part of the city walls, which were destroyed by Mussolini in 1936 although some remains of the walls are still visible. This is one of the most people-friendly old centers you can imagine with lots of narrow pedestrian streets and squares. Corso d'Augusto runs across the center of the city from Arco d' Augusto through the wide open Piazza Tre Martiri to Ponte di Tiberio (Tiberius Bridge). There is excellent shopping along this route and on the side streets, including via Gambalunga which runs between the two pedestrian squares, Cavour and Ferrari. In the 16th century, markets and tournaments were held in the Grand Square, now Piazza Tre Martiri, where an attractive clock tower from that era still stands. We took Via G. Garibaldi, another busy shopping street with many attractive food and fashion stores, to Via Sigismondo 79 where we were told we would find dreamy gelato at Sigismondo Gelateria. It was a very good tip, ideal flavors and texture. Daniele suggested we have a meal at Ristorante Pic Nic, Via Tempio Malatestiano 30, Tel. 0541 21916. The pretty quiet street, which houses the Malatesta Temple, got us in the mood for this haven of rustic charm and traditional culinary specialties. On the way to our table in the glassed in garden room (which opens to an elegant garden for outdoor dining) we passed the most awesome antipasto buffet imaginable. The pressure was on. Should we bother looking at the menu? Should we choose only from the buffet? Should we combine menu choices and the buffet? We settled into the comfort of our colorful surroundings and were granted a stay of decision making with the arrival of a house appetizer of polenta, frittata, fried zucchini and onion strings, and fried mashed potato accompanied by a basket of warm focaccia. Each and every item was a savory delight. Our waiter was a charming seasoned pro who was absolutely no help in decision making. His answer to our probing was simply that everything was excellent and it was up to us. The regular menu was a relatively short list of basic items. The daily menu represents preparations of the freshest market ingredients and there were many wonderful choices but still no help from our friendly waiter. Finally, finally we got him to admit that the clams were fresh from the water, that this was of course carciofi season and that the veal and swordfish were very fresh. The deed was done. Strozzapreti alle vongole e pomodoro verde (hand rolled spaghetti with shelled clams and pieces of green tomato) in clam juice, olive oil and pepperoncini and Tagliatelle al carciofi, tossed in olive oil and a touch of butter. Even naked the freshly-made pastas would have been a dream, but mated they were sheer ecstasy. The portions were very substantial. 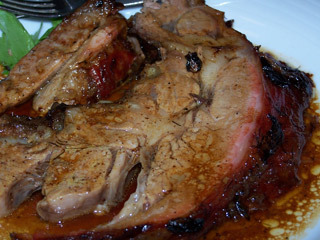 The roasted veal and grilled swordfish were served with roasted potatoes. The freshness of both was unquestionable. The veal tasted like a practiced nonna was in the cucina. A grill master did the swordfish. Thank goodness we were served a generous bowl of the amazing roast potatoes. After the long, leisurely lunch, we had decided against dolci and were waiting for our coffee to arrive when our buddy delivered a plate of assorted cookies and biscotti. My partner, after a few nibbles, told me we would be remiss not to devour every last crumb, which we did. Pic Nic, the first recommendation of every local, deserves its great reputation and popularity. The Malatesta Temple (now a Basilica) was built by Sigismondo Pandolfo Malatesta as a memorial tomb for his family. Constructed on the site of the 13th century church of San Francesco, the white marble facade is quite stunning. Giotto decorated the Temple and one of his stunning wooden crosses hangs behind the simple altar. Throughout the church there are symbols of the Malatesta family and many sculptures decorate the pillars and side chapels. The Church of Santo Agostino was built in the 13th century by the Agostiniani. 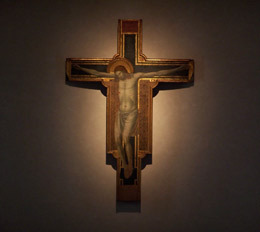 Of principle note are the wooden crucifix from the 14th century Rimini school of art and 14th century frescoes that were discovered after the 1916 earthquake. Construction of the Tiberius Bridge began under the Emperor Augustus in 14 A.D. and was completed under Tiberius in 21 A.D. Built of Istria stone with huge pillars and five arches, it crosses the Marecchia River, connecting the city center to Borgo San Giuliano, a picturesque and colorful old fishing village. 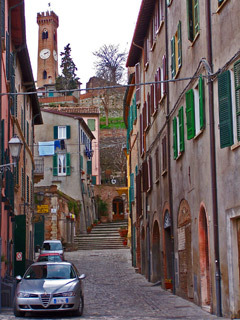 Borgo San Guiliano is precious with its neat, spotless narrow streets, tiny squares, small colorfully painted houses and murals of historical and cultural significance. 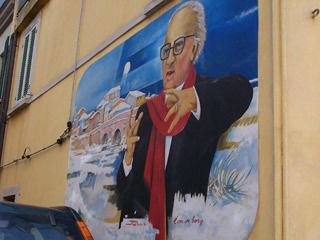 Several of the murals are dedicated to the maestro, Federico Fellini, born in and raised in Rimini. A wall of nicknames commemorates the local tradition years ago. The Malatesta were one of the most influential families in the history of Italy. They owned substantial lands around Rimini especially in the Marecchia and Conca valleys. It is believed that the family had its origins somewhere in the middle of the Marecchia valley, specifically in Verucchio. The Malatesta Seignory in the valley consisted of the municipalities of Santarcangelo, Verucchio, Torriana, and Poggio Berni. These four fortresses, together with Montebello, were the chain of defense of Rimini and the surrounding farmlands. Since Santarcangelo and Verucchio were accessible by bus we were off for a visit. Line 9 bus from the train station was right on time at 13:06 and had us to Santarcangelo at 13:28. 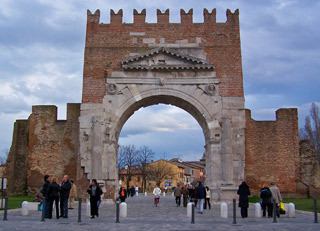 This town was founded in Roman times (268BC) right after Rimini, during the construction of the Emilia Way that passed through it. We found an adorable, impeccably clean old town center of narrow streets and small squares linked by short flights of stairs, beautifully maintained homes and palaces, and quaint wine bars and restaurants. The bus dropped us at Piazza Marconi from which we began our journey. On Via Cesare Battisti we found the Marchi Historic Dye-Works where you can view the ancient craft of printing traditional motifs (mostly in the green, blue and rust color combination) on tablecloths, bedspreads, etc. The Museum of the Armlet Ball Game and of the Tamburello has a collection of gaming apparatus documenting the history of the game of Tamburello which is stilled played in the Sferisterio (the open field at the foot of the 1447 boundary wall). The game was played with a hard leather ball and a bracelet worn by the competitors. The bracelet made contact with the ball, which was hit against the wall until someone failed to make contact or missed the hitting the wall. A set of stairs led us up to Piazza Balacchi and the Collegiata Church which dates back to the 18th century. This is the town's main church and contains some notable works of art. On the left side by the entrance is a painting by Guido Cagnacci (born in town) entitled "S. Ignatius Loyola in Ecstasy. In the transept on the right is a crucifix of the 14th century Rimini School and on the left an altar painting by Bonomo. This old town is honeycombed with over 100 tufa caves that make up what amounts to a subterranean town. These caves are used as wine cellars and storage spaces and who knows what else. 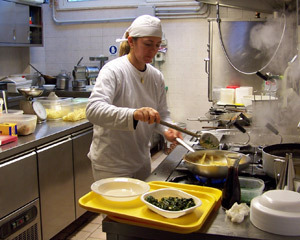 La Sangiovesa is a restaurant in Piazza Simone Balacchi that has been established in an ancient palace. 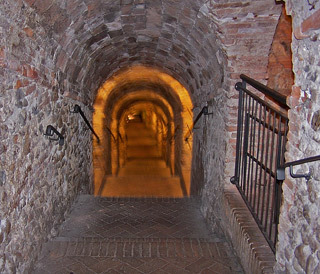 We had heard that besides serving outstanding cuisine their wine caves could be visited. Fortunately the chef was available when we knocked on the door and agreed to let us take a look. Entering the dining rooms is a trip back in time. A dramatic dining environment has been created within the cavernous stone and brick walls and floors, wooden beams and archways. One flight down is a wine bar and another stone and brick stairway leads down to the enchanting tufa caves, which are linked to other caves in the vast underground network. A few more twists and turns and staircases past lovely small houses brought us to the prettiest town square, Piazza delle Monache, surrounded by fine buildings with a medieval well in the center. More stairs, more charming houses and more superb views, we could see Rimini in the distance and appreciate the sight of the Campanone Tower, the 25 meter high tower that is the symbol of the city. The Capuchin Convent is surrounded by trees and shrubs and affords a splendid panoramic view of the surrounding countryside. This Franciscan Monastery has four permanent residents and just ten novices at a time in residence. Nearby is Malatesta Fortress which today belongs to the Colonna family. The part built by Galeotto Malatesta in 1247 no longer exists; the square tower dating to 1386 is the most ancient part. The inner part consists of a paved courtyard, a stone cistern and three furnished rooms from the 16th century. On our way to the bus we stopped in the large Ganganelli Square to see the triumphal Arch, erected in 1777 in honor of Pope Clement XIV. Across the square is the Town Hall which was built in the 19th century. Line 164 bus picked us up at 15:51 and we arrived in Verucchio (Piazza Malatesta) at 16:25. This medieval town square is home to the Palazzo Del Municipo, the 18th century Palazzo Giungi and the neoclassical Palazzo Bedetti. Verucchio sits on high and offers a splendid panorama over the Marecchia Valley. By walking around the renovated town walls you can appreciate the view and get a sense of how defensive structures were built during the time of the Malatestas. Between the 12th century and 1462, the Malatesta family ruled the region from their stronghold, the Castle of the Rock, their fortress atop an immense rock spur above the town. Due to many architectural changes between the 12th and 16th centuries, it's a hodgepodge of styles, but imposing nevertheless. There are interesting displays of weapons and armor and a dungeon that may be visited. There was another Malatesta Fortress on the rocks across the way called, Del Passerello Fortress and Gate. The Monastery of the Nuns of Saint Claire, which was built on the remains of the fortress, is now undergoing renovation. 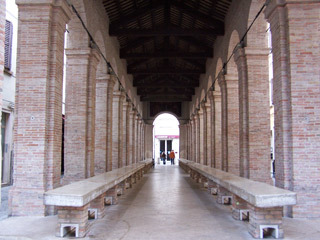 The Municipal Archaeological Museum is located in a former Monastery of the Augustinian Fathers. The museum was opened in 1985 and features discoveries made by systematic excavation between 1960 and 1975 which revealed hundreds of burial sites from the period between the 9th to 7th centuries B.C. Artifacts made with organic materials have been conserved by the characteristics of the rock in which the tombs were cut. There are urns containing the ashes of cremated bodies and remains of weapons, ornaments, buckles, pottery, wooden artifacts and even a wooden throne decorated with human figures. The 164 line bus that was supposed to arrive at 18:32 to connect us to the Line 160 bus at Stazione Rosa never showed up. It was getting cold in Piazza Malatesta here on high so we stopped a car and asked if they were heading down to Stazione Rosa. They were kind enough to go out of their way to take us so that we could make the next #160 back to Rimini. Our last treat in Rimini was at Gelateria Arcobaleno Bio which is located in the rear of the "skyscraper" on Viale Principe Amadeo, the tallest building in Rimini. This tiny Rimini institution makes gelato with only natural ingredients and the constant line ups attest to the exceptional quality and flavor  definitely worth the wait (and the weight!). Rimini was a total treat and another good reason to get back to Emilia Romagna.